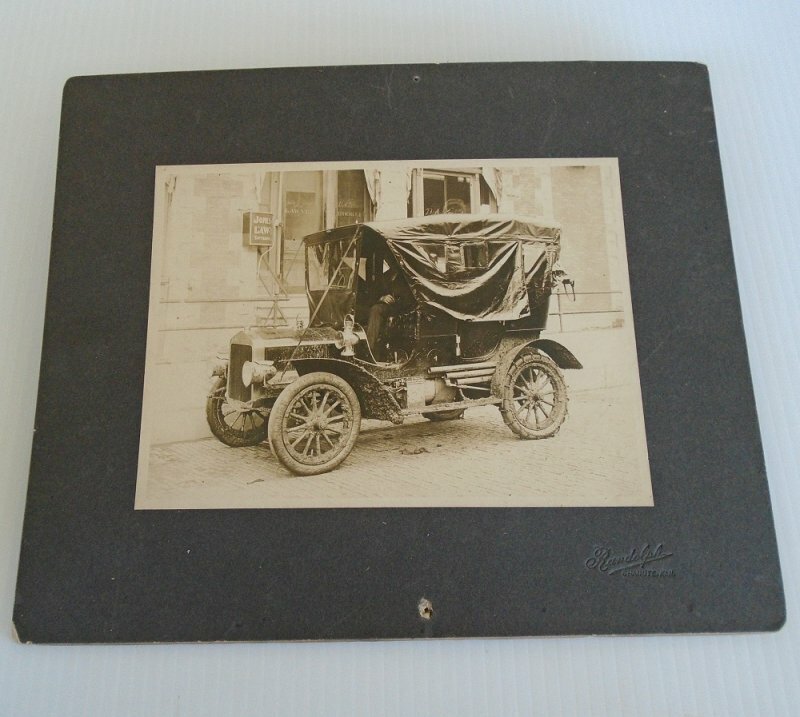 1908 Ford Model T antique real photo. About 10 by 12 inches. Man sitting in driver's seat. Photo by Randolph Studio, Chanute Kansas. Recently I purchased a box of old photos at an estate sale. This photo was in that box. The photo is mounted on heavy thick cardstock such as a professional studio would have used back in the early part of the 1900s. As mounted, it measures 11.75 by 9.75 inches. The photo alone is about 8 by 6 inches. It's in excellent condition, but someone did tack it to a wall at some time because there are tack holes at the center top and center bottom. There is no writing on the back to give a clue of who the man is that's sitting in the driver's seat, also no handwritten location, but on the front in the lower right corner is the studio's imprint of "Randolph, Chanute KAN". Also, there were other photos in the box that did say "Chanute, KAN", both in photographer stamps and handwritten. What drew me to this photo is that there are a lot of great visuals in the photo (see close up photo below). For one, the car has muddy snow all along the bottom area of it, also note the snow chains on the back tires. Other highlights are the windows on the building in the background have business names painted on to them. One says "Jones, Lawyer, Entrance", another one says "John J. Jones Lawyer", another window has a name that I can't make out but says "Broker", and another one that most of the printing is covered by the top of the car so I can't read it at all. 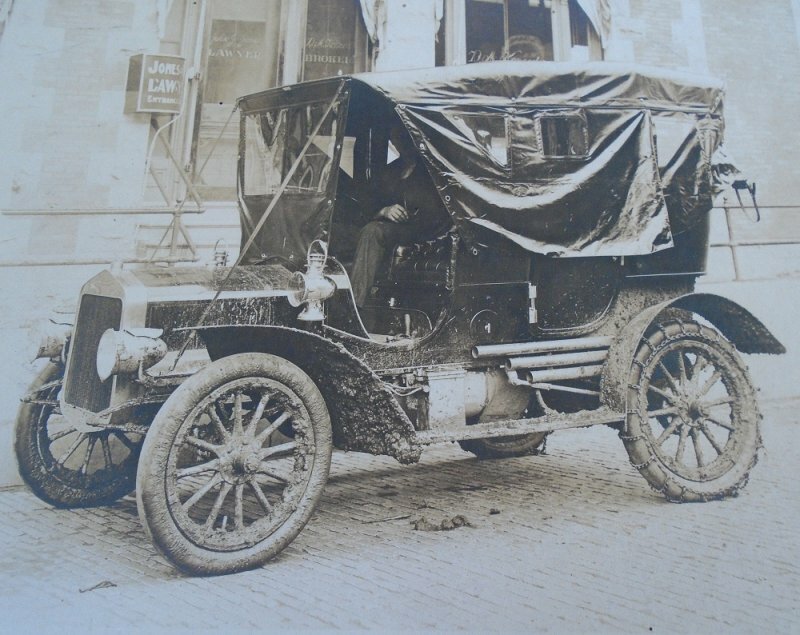 As far as the car actually being a 1908 Ford Model T, I viewed many photos of those types of old cars to try to determine the make and model and am fairly confident, but not positive, that it is a Model T.
Delivery will be via USPS First Class Mail from Arizona. Buyer to pay delivery charges of $5.20.